September is one of my favourite months of the year. It still has a warm summery feel, but the signs of autumn start appearing. There’s something about it that feels so fresh, and I love that. New school stuff, new routines, new found energy. It’s a fresh start. 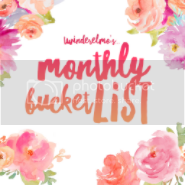 I’m hoping to embrace that fresh start this month and organise myself a bit better, so my September bucket list will reflect that a bit. But first, an update on my August goals. Have a proper day out once a week – I guess this kinda happened every week except the last. We headed in to Newcastle Co. Down for the day and ate chips on the promenade before heading to the amusements for the afternoon. The kids even rode their first roller coaster in the little fair behind the amusements – cue lots of screaming! We had a picnic at the castle. We also went on an impromptu camping trip for three days, which was awesome. Go to the beach – Unfortunately this didn’t happen. We never seemed to get the right weather for it. The best weather seemed to happen while I was at work, and it rained on my days off. Typical! Get a Mauds ice cream – We got a Mauds and it was delicious! When we were camping, the little town next to the campsite had a Mauds. The kids thought it was great because the man behind the counter could ‘read their mind’ and guessed what ice cream they were going to pick. I got a salted caramel one and it tasted like heaven. Blog more – This didn’t happen. I think I blogged less than the previous month, but with good reason. Hopefully September will be a better blogging month! Be more organised – I want to organise myself better this month. I’m chaotic at the best of times, and I really need to sort that out. I want to have uniforms and bags ready for school the night before to eliminate the morning panic. I want to keep on top of my blogging as I’m drowning a bit at the moment. I also need to stay on top of the housework as I’ve been lacking a bit over the summer. I have a bullet journal which I haven’t been using over the summer so I’ll be using that to help me get a grip on things! Blog more – I think I’ve said this every months since I started doing monthly goals, but I mean it this month. I really do! I want to at least do more than I did in August. Read the Harry Potter books again – I’ve just downloaded the series on to my kindle and I want to read them all again this month. I’m a big Harry Potter nerd but it’s been a while since I read them all from start to finish. Start exercising again – I’ve been slacking a lot and I really want to get back to exercising this month. I might join the gym, but I haven’t decided yet. If I don’t, I want to at least get out walking with my husband, and maybe some cycling and jogging to ease myself back in. Please do check back next month to see how I got on with this months bucket list. Hopefully September will be more successful than August, but we’ll see! It sounds like you had a great August….Good luck with your September plans. How crap am I not commenting?! OOOOOPS massive soz!! !